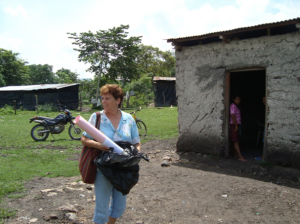 The following documents were put together by Ellen Finn (Project School Supplies ) and Carol Brouwer (A Better World) after last weeks visit to San Jose / Guatemala…..a village on the frontera right on the other side of the border from Copan Ruinas, Honduras. Those of us who visited were so distressed by the needs of this incredibly impoverished village that we wanted to express some of our impressions. 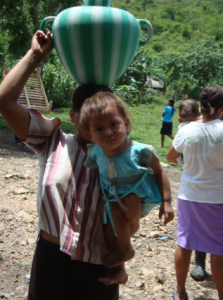 Ellen has already started exploring how to help these folks access a reliable water source. 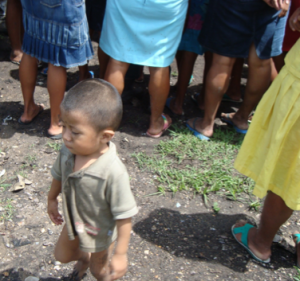 San Jose de las Lagrimas, Guatemala is a large village (70 families) just over the Honduran border. The people are extremely friendly and very willing to collaborate on any projects to improve it’s situation. When we went to measure for the water source (about 5 kms) the village leaders met us and within minutes there were more than 45 men, walking out of their farms to help cut a swath through the jungle, so that we could measure. Marel, my assistant told me that it was an absolutely amazing and touching site to see. The dwellings are made of plastic, much of it torn from years of use, and sticks tied together. Not all dwellings have 4 sides to them, leaving them open to strong winds and cold, and animals entering randomly. 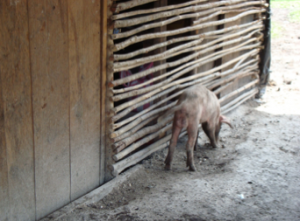 There are chickens and small pigs, defecating on mud floors where children go barefoot. They cook with wood, directly on the ground, leaving the dwellings filled with smoke and many folks here have severe lung problems. Conditions are crowded, with often two families to a dwelling. We originally went there to deliver school supplies and assess school needs and quickly discovered that there were more pressing needs. 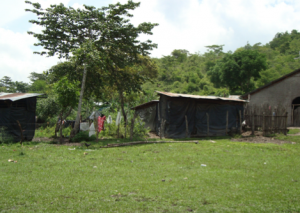 They have no latrines and a single water source that arrives only 3 times per week. The people “go to the bathroom” in the fields and the rains carry the mud and excrement into the village proper. 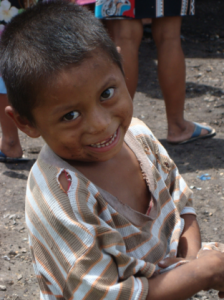 Many children do not only not have shoes, but are dressed in very flimsy, hole ridden clothing. Many little ones do not have pants or shirts. The school is a broken down adobe building with one window and a broken door. Virtually no school supplies (we brought the teacher a much needed blackboard as well as some teaching materials). It has a mud floor. The school itself is a breeding ground for any germs or illnesses that might be present. There are 65 children jammed into this school. There are many sick people in this village……ranging from dysentery to tuberculosis, and other lung ailments. There are two diabetics in need of amputation, but will not go to the hospital due to lack of funds. This entry was posted on Wednesday, July 6th, 2011 at 9:11 am	and is filed under Copan Ruinas. You can follow any responses to this entry through the RSS 2.0 feed. You can leave a response, or trackback from your own site. Wow! I just read about your adventure in last Thursday’s Advocate. I phoned your in-laws to see if the Carol Brouwer from Red Deer was our Carol from Woody Nook/Blackfalds. Barry answered and assured me that it was you. Good for you!! I just read your distressing blog. If often seems to me that natives make our fairly well until us whites move in, but that isn’t the case there. How have they survived for generations? What is your solution—give them the supplies to build homes, latrines, schools? Are there local things they could use? I better go back and read more of your blog. Your money probably comes through Better World, so if we wanted to give some, it should be through them, right? Hi Betty. I need to check this more often. Came across your note this morning. I have been doing projects in Honduras for about 4 years now and have developed a personal philosophy on what I take on. The classrooms I have built are only done after we meet with the community and they have a rational need, and commit to supplying all the labor if we supply the materials. it has worked incredibly well and not only does the school get built, the local folks develop building skills and increase their sense of community. I have stayed involved in a couple of the communities where the schools are built and have started doing some small things to improve food access, income generation etc. 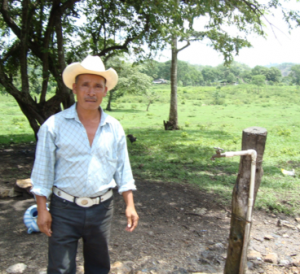 So, some micro loans and small agricultural endeavors……again at the request of the community. My favorite project so far has been the chicken house that we built for a school to both offer some non conventional learning for the kids and also supplement their diets. I want to do more of these. My second favorite is the computer based learning project that we are piloting this year in partnership with Canadian Peacemakers international. The kids in rural areas have next to no access, resources or motivation to continue past Grade 6. So, I see one of my focuses as being supporting and encouraging education past Grade 6. It’s been such fun and it’s especially rewarding when the projects “work” and I get to know the communities so well. yes, the work is under A Better Worlds financial umbrella.